Political analysts have warned DA leader Mmusi Maimane against intervening in Zimbabwe after he wrote to President Emmerson Mnangagwa asking to meet over the ongoing crisis in the neighbouring country. Zimbabwe descended into chaos after Mnangagwa announced a 150% increase in the fuel price. Protesters have demanded a decrease in the price and a change of regime. “In the light of the fast deteriorating situation in Zimbabwe, I intend to head up a SAPDC (Southern African Partnership for Democratic Change) fact-finding mission there as soon as possible, which would include a meeting with your government. Please indicate a date and time next week which best suits your schedule,” noted Maimane in his letter. The South African government, through the Department of International Relations and Co-operation (Dirco), had previously said it was confident Zimbabwe’s government would resolve its problems. Dirco spokesperson Ndivhuwo Mabaya said consultations were taking place, and measures were being taken with the Zimbabwe government to improve the situation. However, Maimane charged that there was a lack of political will to intervene in Zimbabwe’s affairs. “No meaningful action has been taken by (President Cyril) Ramaphosa or his government. 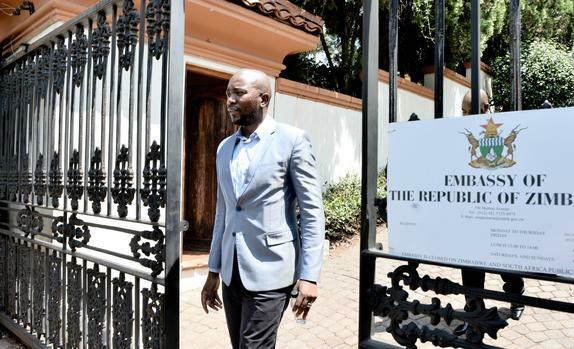 The era of ‘quiet diplomacy’ continues, as the Department of International Relations and Co-operation has to date simply expressed confidence in ‘the measures being taken by the Zimbabwean government’ which will ‘resolve the situation’,” said Maimane. He said he was intervening as chairperson of the SAPDC, which represents opposition parties from the Southern African Development Community (SADC) region. “The situation in Zimbabwe is dire. Widespread civilian suppression, military-led violence and bloodshed has ensued with hundreds arrested and detained by government authorities. Assault, torture, inhumane and degrading treatment of citizens continues, while President Ramaphosa sits on his hands and refuses to take action,” said Maimane. Political analyst Levy Ndou has, however, warned that in intervening, the DA must be careful to not undermine the sovereignty of Zimbabwe. “The move by the DA is part of the political game. What they need to note seriously are the parameters of diplomacy and foreign policy. The responsibility of foreign policy lies with the presidency and Dirco. “Another point will be that Zimbabwe is a sovereign state, and because of that, you don’t just intervene. When you do so, you are undermining the existence of that state,” said Ndou. Ndou said South Africa was, however, in the right position to intervene through the structures of SADC as a neighbouring country, because it would be affected if there were a “meltdown” in Zimbabwe. “The situation in Zimbabwe, bad as it is, has a serious negative effect on South Africa. “These are the same Zimbabweans who will run, cross over to South Africa legally or illegally. “It will require South Africa, whether it is through SADC or the AU, to do something,” said Ndou.